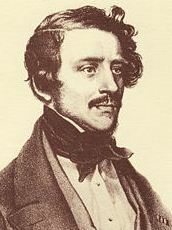 In 1822 at the age of 25 Donizetti had a first success with Zoraïda di Granata, after which he moved to Naples, Rome and Milan. In 1830 the opera Anna Bolena was has major breakthrough. L'elisir d'amore and Don Pasquale are deemed to be masterpieces of the comic opera; Lucia di Lammermoor became his most famous opera and one of the high points of the bel canto tradition. He moved to Paris where he wrote La fille du régiment, which became another success. As of 1943 he exhibited symptoms of syphilis and insanity (bipolar disorder). He died in his hometown Bergamo in 1948 at the age of 50. Along with Rossini and Bellini, Donizetti is generally acknowledged as one of the masters of the bel canto style.